All those in residential care have suffered losses of various kinds. Many will have lost their spouse and all of them will have had to give up their home and most of their precious possessions. They have probably lost physical or mental faculties. These losses cause much pain and sadness. Therefore in addition to providing physical care, it is vital that Care Homes provide spiritual care and healing for the residents. Basic human spiritual needs are common to all people, but individuals have the right to choose how these needs are met. This generation of elderly people have mostly been brought up in the Christian faith but ministers of other faiths can be contacted when requested. If given the chance, elderly folk will often ask questions about death and the value of life. Good spiritual care increases the sense of self-worth, makes it easier for residents to fit happily into the communal life of the Home, and reduces the distress caused by the death of other residents. 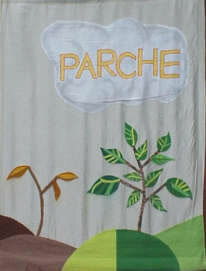 The banner depicts PARCHE as a rain cloud, bringing “Living Water” to the thirsty ground of Residential Care Homes, enabling the parched plants to blossom and flourish as they did when they were young.